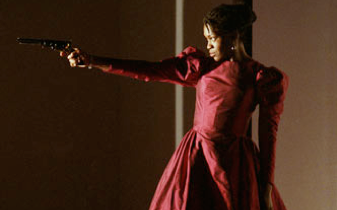 Volcano’s production of Ibsen’s classic Hedda Gabler (1890) is a good news/bad news proposition. The best news is that Yanna McIntosh as Hedda proves yet again that she is one of the finest actors of her generation. She is absolutely riveting in one of the most complex female characters in Western drama, a woman who longs for greatness but is hampered by social convention and her own self-consciousness. The good news continues with a first-rate cast, including Tom McCamus as the tortured genius Eilert Lovborg, all acting at the highest level. The bad news is that the production lets go of greatness for the sake of a concept that doesn’t work. The first half of the play is set in Norway in 1890, the second half in Toronto in the present. While the first half is truly exciting, the second continually trips over Thompson’s inept updates. She locates modern Toronto on a fjord and she has no way to explain the central image of the play – a brand new manuscript crucially existing in only one copy – in an age of laptops and photocopiers. Worse, Thompson turns what should be Hedda’s attempt to end her life with honour, into a messy, raving spectacle that totally demeans the character. Note: A version of this review appeared in Eye Weekly 2005-06-02. Photo: Yanna McIntosh as Hedda. ©John Lauener.